Best dinner ever! That is what I almost entitled this post. Apparently I throw this phrase around a lot, because last February, I declared that Spaghetti Pie was the “Best Dinner Ever!” Oh, well; I don’t mind frequently having the Best Dinner Ever. Oh, by the way – did you guys enter my Duncan Hines giveaway yet? It is still open and accepting entries (in the form of a simple comment) HERE until 11:59 tonight, which is Wednesday November 23. This November I have been on the fence as to whether or not I wanted to create our own “Thanksgiving-For-2” feast again, like I did last year. This would be in addition to our big meal with family tomorrow! However, I decided that for two people, it’s just too much work, so instead, I decided to try to incorporate a few Thanksgiving-inspired dishes into my weekly menu. 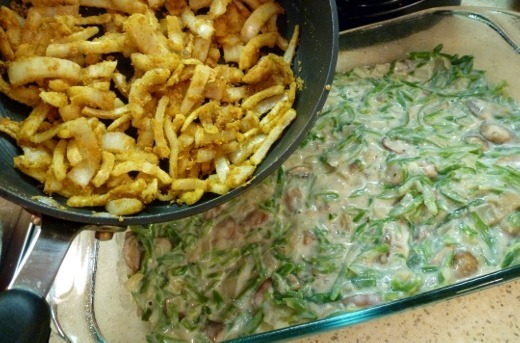 Green Bean Casserole is just NOT a dish that I grew up with. It seems foreign and odd to me, and honestly I just don’t seem to identify it with Thanksgiving. But, everyone has their traditions so I decided to embrace his and make a less-gloopy-white-stuff-from-a-can-with-weird-crunchy-things version, and instead make a more “from scratch” version. Not that I’m necessarily “above” using canned condensed soup, but I thought a homemade version would be both healthier and more fun to make. 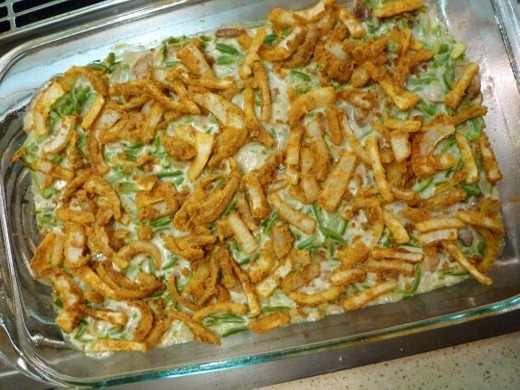 I selected a recipe from Eating Well that had good reviews; you can view the Green Bean Casserole Recipe here. 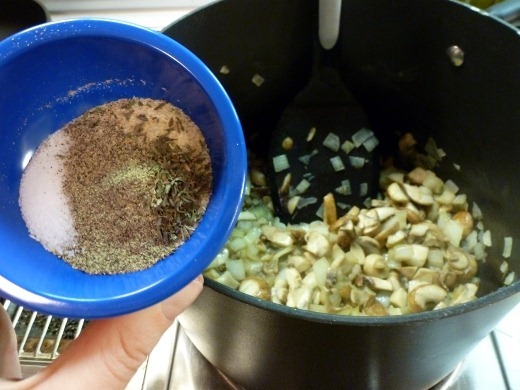 First I sautéed onion and mushroom in EVOO, and then added onion powder, thyme, salt, pepper. 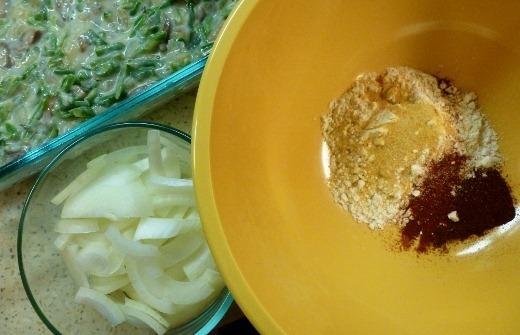 Sprinkle with flour, then add milk (and sherry if you have it – I used a tiny bit of veggie bouillon instead). 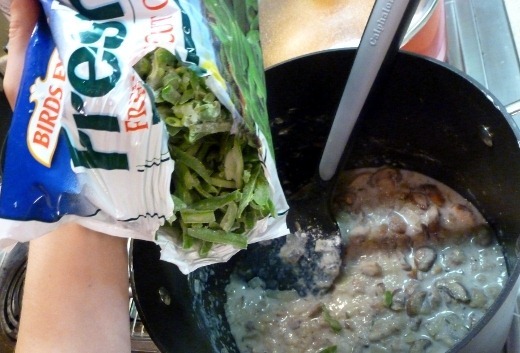 A giant one pound bag of frozen French-cut green beans was added next. Frozen taste so much better, and are so much more nutritious, than canned green beans [source]. 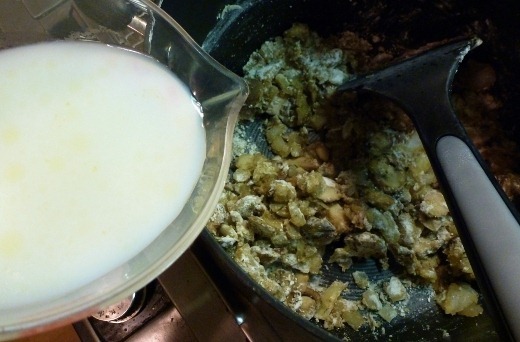 For added tang and creaminess, light sour cream and three tablespoons of buttermilk powder were also added. Buttermilk powder was not an ingredient I had on hand and I was a bit hesitant to drop $4.99 on a package of it. However, once I started to think about it, it really is a great idea! 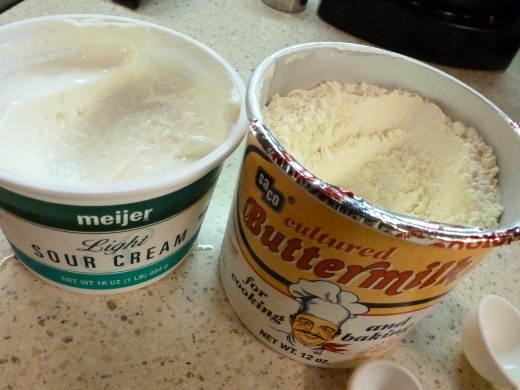 This recipe simply required the powder, however, the powder can also be mixed with water to produce buttermilk. 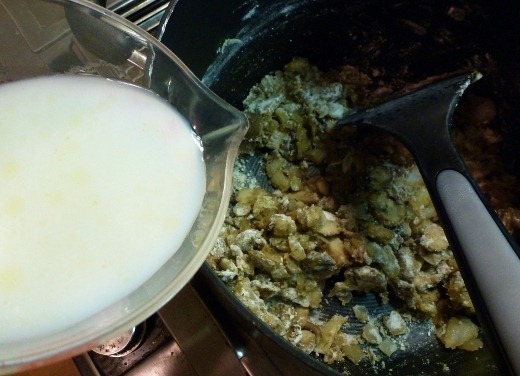 So often, recipes call for a small amount of buttermilk, and then one is left with a big container of buttermilk that all too often goes to waste. With buttermilk powder, you have a product that will produce less waste with a longer shelf life. The primary downside for me, however, is that the powder requires refrigeration after opening, so it now takes up precious space in my not-so-big fridge. Still, I look forward to having buttermilk on hand when needed in the future. I will have to do some research to determine how long the powder stays fresh in the fridge. 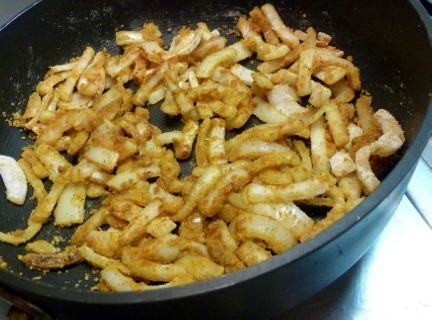 Another vital step: preparing the crispy onions for the top of the casserole. 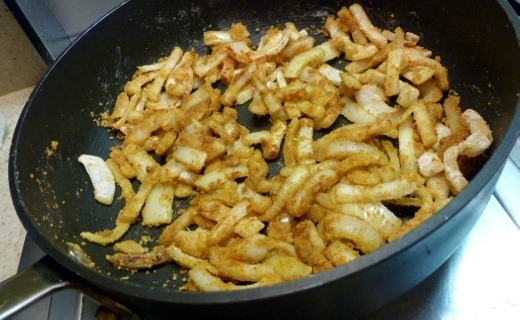 I tossed sliced onions with flour, paprika, garlic powder, and salt, and then fried them over medium-high heat for a few minutes, until browned. Mmm!! 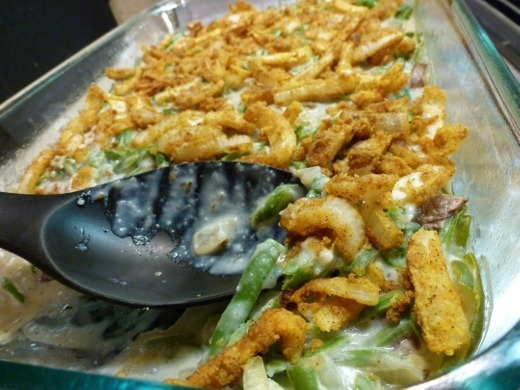 The huz and I both loved this Green Bean Casserole! 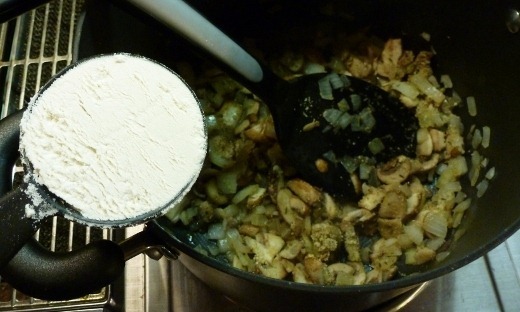 The recipe makes six large servings, with 212 calories per serving. Not bad at all for this super creamy dish. 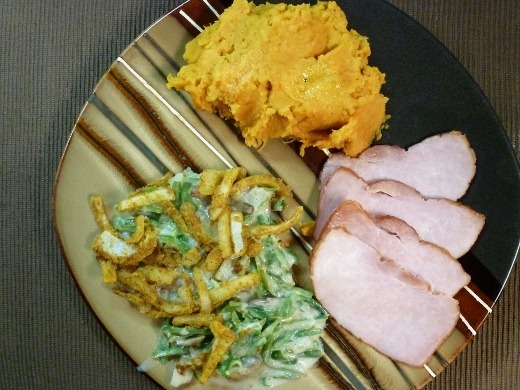 I made another Thanksgiving-inspired side dish to go with dinner. I chopped up one peeled GIANT sweet potato, and steamed it for about 15 minutes. To finish it off, I added a drizzle of honey, 1-2 T brown sugar, 1 T butter, cinnamon, and salt, and then mashed my little heart out. You might see honey and brown sugar and think that these were very sweet, but quite the contrary. 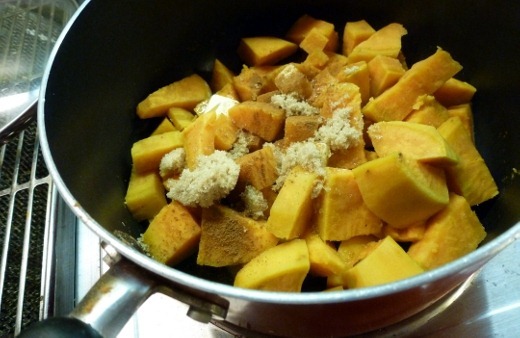 I used a very conservative hand when adding the sweeteners – I am not a fan of overly sweet…well, anything, but especially of overly-sweet SWEET potatoes. I just want the subtle inherent sweetness of the potatoes to shine, and not to completely cover the flavor with sugar. Oh my word, I want to eat this every night!! The huz said it was one of the better dinners we’ve had in a long time and I agree. 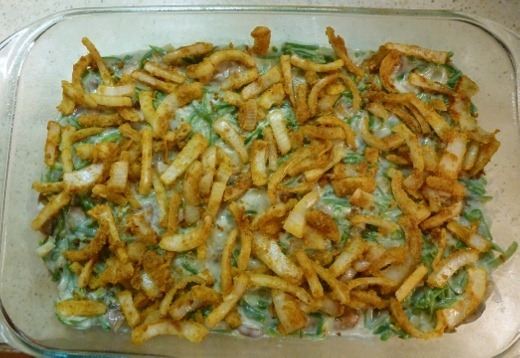 I definitely recommend the Green Bean Casserole Recipe (Rating: 8.5/10). I’ll be announcing the winner tomorrow (Thanksgiving!). Currently listening to: If I Had A Gun – Noel Gallagher. 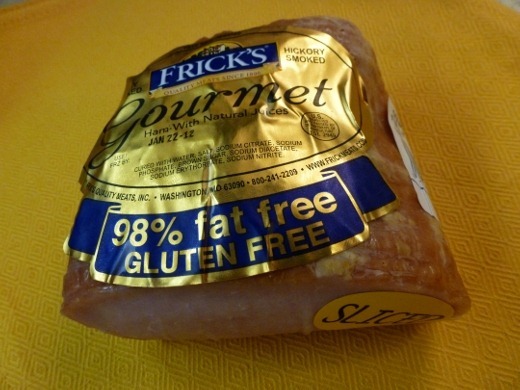 Pingback: Start to the Long Weekend–Giveaway Winners « Meg.Goes.Nom.Nom.